The other day big sports news hit here in Seattle. Well at least big news for NHL fans which I am not. I do know or care about the sport of hockey. Real talk. It was announced that the NHL is coming the Seattle in a few years when Key Arena is remodeled. There is a sports jock on a local sports radio station who is thrilled to death that the NHL is coming here to Seattle. Yes their is serious hockey fans here in Seattle. Season tickets for a un-named hockey team sold like hot cakes. That is great for NHL fans here in town. Here is a few points that need to be made. The NHL condones violence. It takes place on the ice just about every night. All you have to do is watch Sports Center on ESPN. There are vicious fights on the ice where players drop the sticks and go at it. Fists flying, teeth being knocked out, blood dropping on the ice and more!! Hell these players fighting in the NHL should be arrested for assault. These are facts ladies and gentlemen. Yes, arrested for violence!! Once every blue moon a player or two will get a big fine or a few games suspended. But most of the time it is “Oh well another fight” kind of reaction. Broadcasters who have seen fight after fight don’t get to excited when a fight breaks out during a hockey game. If you don’t think I am telling the truth, then go to You Tube and watch a NHL fight with the broadcasters talking. They act like fights are no big deal. This is flat out WRONG!! Readers here is a point that needs to be discussed but sports radio will not. When a fight breaks out in the NBA/NFL and one punch by a player takes place and with quickness they are called “thugs” by the media!! Has ANYONE reading this story ever heard of a NHL player called a “Thug?” I have not. And yes, the majority of NHL players fighting on the ice are white and the majority of NBA/NFL players are African American. Is this fair? The answer is no!! Fighting is accepted in the NHL, but not accepted in the NBA and NFL. Also in Major League Baseball, fighting happens when a pitcher hits a batter with a pitch. The batter gets mad and charges the pitcher. THEN ALL HELL BREAKS OUT!! With players coming from every where!!! I will give MLB some credit. They will throw down a huge fine and suspension to players who are involved in any type of fights. BUT then again WHY does MLB allow players to run in to join in on fights. The players come from the outfield bullpens they come from the dugout, they come from everywhere! But in the NBA, a player CANNOT step foot on the court to join in a possible fight. This is great. 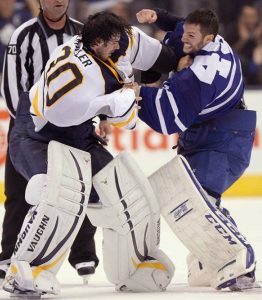 In the NHL when you see a fight, it is not a bunch of players fighting using their sticks etc. Most of the time it is a one and one fight with players throwing punch after punch. So in ending I do not care about the NHL coming to my city of Seattle. What I care about is the return of the NBA and our Seattle Sonics!! Our NBA team was here for a whopping 41 year!! Then all of sudden they were gone to OKC when owner Clay Bennett moved the team. As a NBA junky it was like a family member died. My team was gone. The NBA has grabbed the “hip-hop generation.” You see players or ex players doing commercials and marketing on TV ALL THE TIME! Players like Durant, Chris Paul, Curry, Lebron, Anthony Davis, Damian Lillard, Shaq, Barkley, Harden, Westbrook, Dr. J, Draymond Green, D-Wade and more. And the same with NFL players like Aaron Rodgers, Beckham Jr, Von Miller, Brett Farve, Richard Sherman, Russell Wilson, Cam Newton, Manning, Joe Montana, JJ Watt and many more. Do not see basically any current MLB players doing commercials BUT I see ex players like Frank Thomas and Johnny Bench and Reggie Jackson doing commercials. But I do not see ANY NHL players doing commercials/marketing on TV. Young inner city kids have zero idea about the rules or players of and in the NHL. No idea what so ever!! I can only name one NHL player and that is Sidney Crosby. He is a NHL superstar. Young inner city kids and myself can care less about the NHL. Will I see the sport I love the NBA in Seattle soon? Do not see a expansion team in a horizon. And I do not see a team moving here after our arena is remodeled. I will continue to say a prayer every night that the NBA will return to the Seattle they should have NEVER left!!! Guys like D-Wade and Kevin Durant and Russell Wilson want to help bring the NBA back to my city. I hope it happens before I get to old to enjoy it.